These lamb kebabs from The Saffron Tales by Yasmin Khan are fabulous cooked over hot coals. Ask your butcher for lamb neck, it’s cheap and really tasty. Good served with saffron rice, herby salad and yoghurt with cucumber and mint. They were also good stuffed into some warm flatbreads with a radish and broad bean salad (see pic below). Wine Suggestion: We chose the Poggio ai Ginepri which is a Cabernet, Syrah & Merlot blend from Bolgheri in Tuscany. The classic Bordeaux blend with the infusion of Syrah creates a balance of power and juiciness that works with the BBQ smokiness and the moist lamb with a good earthy spice that compliments the herbs and spices in the marinade. Mix the yoghurt, onion, garlic, oregano, oil, sumac, salt and pepper together in a large bowl. Stir in the lamb pieces until well coated then cover with cling film and leave to marinade in the fridge for 2-3 hours. Don’t skip this as it will make the meat nice and tender. Preheat the barbecue. Thread the lamb onto metal or wooden skewers (wooden ones need to be soaked for about 20 minutes before using). Cook the lamb kebabs and the tomato halves on the barbecue for 5-7 minutes or until cooked through. Rest the meat for a few minutes and sprinkle with some more sumac before serving. A perfect cooling accompaniment for barbecued lamb kebabs and Persian rice dishes. The fresh mint can be replaced with fresh dill. Cut the cucumber in half and scoop out the watery middle and seeds with a teaspoon. Grate the cucumber and squeeze out the excess water over a bowl using your hands. Mix the cucumber into the yoghurt, along with the garlic, dried mint, fresh mint, dill, sultanas, salt and pepper. Stir well before serving. We have made this dip many times as we, and our friends, keep on devouring the lot before a photo can be taken. Not really problematic as we love it so much. 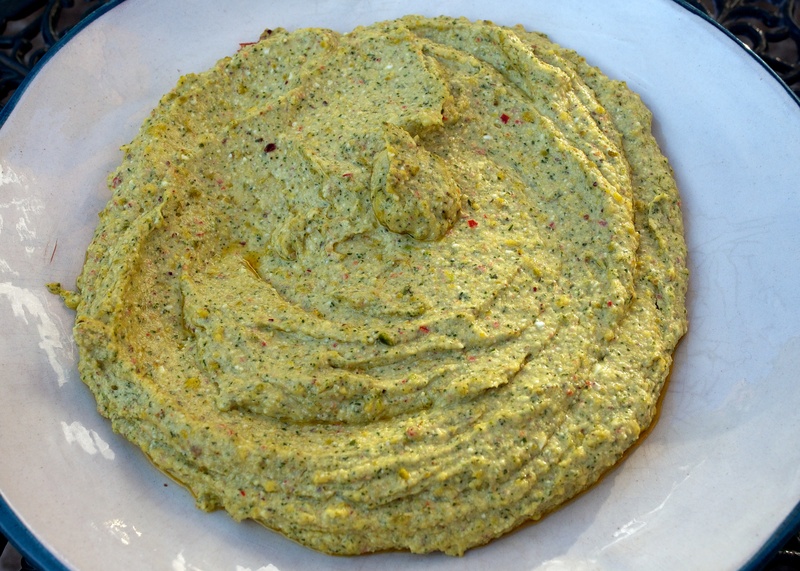 We finally got a photo 🙂 but will keep on making the dip, which has become a firm favourite and works great as a starter to share with some barbecued flat breads. Blitz the pistachio nuts and oil in a food processor for 30 seconds. Add the feta, herbs, crushed garlic, chilli, yogurt and lemon zest and juice and blitz for about 1 minute, or until the mixture has a rustic texture. Taste and add salt if needed but bare in mind that feta is already quite salty.